Military Geography is a subject that has interested many people for centuries. Military professionals, academics and historians have studied the impacts of physical and human landscapes on military operations in great detail. Today, interfacing with geographic information science and technology, applied geospatial research and the follow-on implementations thereof have greatly impacted the full range of military and homeland security operations. 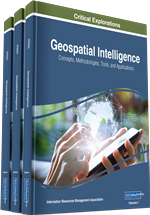 Complex uses of geospatial applications across many domains, in both the physical and social sciences, have become increasingly necessary. These include rapid data collection from disparate satellite, aerial, and terrestrial collection platforms, coupled with human intelligence, with follow-on injection into data bases registered to different security levels. Responsive data distribution from which integrated automated and manual geospatial analysis has also been conducted. Products generated from these data, systems and applications have enabled multiple services and agencies to “see” terrain as a common operating picture (COP). This research was previously published in the International Journal of Applied Geospatial Research (IJAGR), 7(4); edited by Donald Patrick Albert and Samuel Adu-Prah, pages 38-40, copyright year 2016 by IGI Publishing (an imprint of IGI Global).